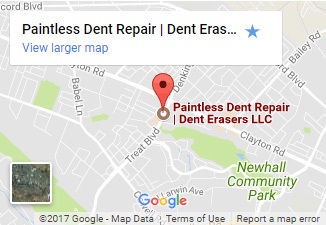 Dent Erasers is a locally owned and operated dent removal service proudly serving the Concord area. Our service style is unique, allowing master technicians to come to you for mobile dent removal. Our service is the least invasive and most environmentally friendly way to remove dents and dings from your vehicle. The best part is, our dent wizard technology delivers paintless dent removal, preventing further damage to your car and saving you time and money. Paintless dent repair costs are lower than traditional body shop dent repair procedures. When you subject your car to a body shop, it will be sanded, filled, and repainted. This process is time consuming, expensive, and tough on your vehicle. They actually do more damage before they fix it. For the right kind of dent, this is all completely unnecessary. Dent Erasers can save customers up to 70% when compared to a traditional body shop. That's a huge savings our Concord mobile dent repair team brings right to you. Dropping your car off for any service is a hassle. Rather than arranging rides and leaving your car for days at a time, Dent Erasers can come to you. In fact, we are often able to accommodate same-day appointments. Our dent pro only takes one to two hours to perform paintless dent repair in Concord, at the location you prefer. Your driveway, the parking lot at work, or even the mall – the choice is yours. We fit our dent repair services around your busy lifestyle. Master Technician and Founder, Brian Blanc, is the expert in paintless dent removal Concord has called on for over seventeen years. His dedication to the craft is evident in his long history of success, performing thousands of repairs throughout the area. He has mastered the art of paintless dent repair and can repair large dents and even creases. Technicians are not all created equal, so call someone you can trust to get the job done right. 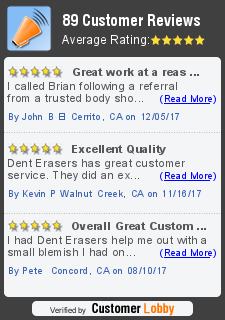 Dent Erasers believes in treating you to amazing customer service and saving you money every time. That includes providing free estimates for our work. The process starts with a simple online form or a phone call. You deserve a car that you can be proud of, free of digs and dents. Our technicians will do it right the first time and get you driving in style again. Stop driving around with a cratered car and call for a free estimate today. As a locally owned company, we care about Concord's environment, too. That's just one more reason why mobile dent repair in Concord is best left to Dent Erasers. Our process is free of chemicals, dust, and pollutants, a claim the body shops certainly can't make. Our process uses very little power, so there is virtually no environmental impact throughout the entire process. The best part about deciding to use our services is that you don't have to take our word for it. We like to let our customers do the talking. We invite you to check out our online reviews, where we have received dozens of five star reviews from your Concord neighbors, coworkers, and friends. Dent Erasers has the experience, cutting edge technology, and commitment to quality service that you and your car deserve. Don't hesitate to reach out for a free estimate today.